The secret to a lush, green, healthy lawn is of course to apply regular water, feed or fertiliser, sun and regular mowing. Mowing should be done at the right time, in the correct way to achieve the best results. Grass is a living plant and like other plants, cutting off the growing points encourages growth from the base of the plant resulting in a more tightly woven, thicker and stronger foliage. Cutting grass regularly multiplies the existing grass plants. If you didn't mow your lawn at all it would be sparse and quite frankly ugly. This image shows a lawn which has had infrequent mowing. The keys fact's you need to consider when caring for your lawn is the frequency of which you mow and the height to which you mow it. Whilst mowing is important and encourages the plant to thicken, we must remember that the leaf is the engine room for the plant and reducing the size of the leaf also reduces the plants strength and growth capacity. Therefore a good looking lawn is achieved by light mowing on a regular basis. Raise the height of the blade in Spring, the first few cuts should be light taking around 1/4 of the blade off. In the dryer Summer months the grass starts to slow down it's growth, make sure you do not take off more than 1/3 of the blade's height. In the height of Summer you should be mowing to a level of 3/4 of an inch to 1 inch. This is based on domestic lawns, for professional lawns such as golf courses this may be different. In Autumn the speed in which the grass grow's will slow down some more as daylight length reduces, make sure you do not take as much off. 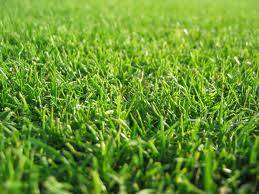 You should raise the blade on your lawn mower so it cuts the grass to around 1-1 1/2 inches heigh. Gradually reduce the amount of cuts you make from this point onawards, aiming for your last cut in late September, early October. For help on feeding your lawn see our Lawn Care Calendar. Make sure lawn mower blades are sharp. Blunt blades will tare and damage the grass, making it harder for the grass to recover. Raise the height of your lawn mower's blades. Be careful if the mower does clog up with wet grass; do not put your hand or fingers in the way of blades! Hose the mower after to flush away clogged grass.